Unlimited commissioned acclaimed British visual and performance artist, Rachel Gadsden, to undertake a research and development (R&D) trip to the occupied Palestinian territories (oPt) in April 2017 to work with disabled Palestinian visual artists. Over a fortnight in the West Bank and East Jerusalem Gadsden organised and led art workshops and exchanges with lead Palestinian artist, Ali Saeid Ashour, and emerging Palestinian artists Amna Hussein, Mahmoud Abu Daghash, Hossam Khdair and film-maker, Isra Odeh. None of the Palestinian artists had previously had any formal art training and from this perspective Gadsden worked with them as both mentor and collaborator. Gadsden and the Palestinian artists also worked closely with 15 women from the Jerusalem Bereaved Women’s Group, which was established to support women who have endured mental health trauma caused by the loss of immediate family members either killed by Israeli forces or civilians, or detained in Israeli prisons. Here on the slopes of hills, facing the dusk and the cannon of time. The title of their project, It was Paradise, is adapted from this poem. Gadsden states that the aim of the group was “to develop a visual language to express global concerns about migration, the lingering flight of refugees, disabled and bereaved people” through “the creation of visceral visual artwork and digital films” – and in doing so, ‘to cultivate hope’ in the artists themselves, their immediate communities, and in wider audiences. Following this first R&D phase, Gadsden and her Palestinian counterparts received a generous International Unlimited Award to develop the project further. This largely comprised an artistic residency over two weeks in the West Bank with the artists in March 2018. The initial R&D leg of Gadsden’s commission gave her the opportunity to gain an essential insight into the complex and difficult local environment caused by Israel’s military occupation, and to develop key contacts that would prove fundamental for the duration of the project and its success. The funding for It was Paradise in 2017 and 2018 provided pivotal opportunities for Gadsden, Ashour and the emerging Palestinian artists to gel, get to know one another, exchange ideas, experiences and techniques, and plan their collective artistic output during the residencies. It enabled the collaborative to produce scores of individual artworks and several large collaborative canvases. This time was also used to capture material that film-maker, Isra Odeh, would have available to produce three short films, each focusing on different creative strands of It was Paradise. Gadsden has utilised her strong network of arts contacts in the UK and Middle East to get the artwork and talent that brought It was Paradise to life the exposure and recognition it deserves in galleries, exhibitions and spaces in the UK, Jordan and Palestine. The project’s work with the Jerusalem Bereaved Women’s Group received a public platform in September 2017 at the recently opened Palestine Museum in Bir Zeit, outside of Ramallah, as part of its inaugural exhibition, “Jerusalem Lives”. In addition, the project’s three films shot and edited by Odeh were screened at the 2018 Palestinian International Young Filmmakers Short Film Festival. For the Palestinian artists involved, the opportunity has been invaluable in a number of ways, not least providing a chance to work with a renowned international artist and collaborate with other Palestinian artists, breaking the isolation disabled artists experience in Palestine. For Ashour and Abu Daghash, the project has led directly to recognition and commissions locally. Ashour also sold art pieces at the Unlimited Festival in September 2018 and was overcome by the interest in his work and story. Additionally, Hussein and Ashour have been able to travel internationally as part of their involvement in It was Paradise, which has also been instrumental in their artistic development, networking, and in breaking the isolation they struggle with. Locally, the awareness and recognition that Ashour, Hussein, Abu Daghask, Khdair and Odeh have received through local media has also raised awareness of the talents and abilities that disabled members of the community possess, and of the individual and collective value of recognising these in society. 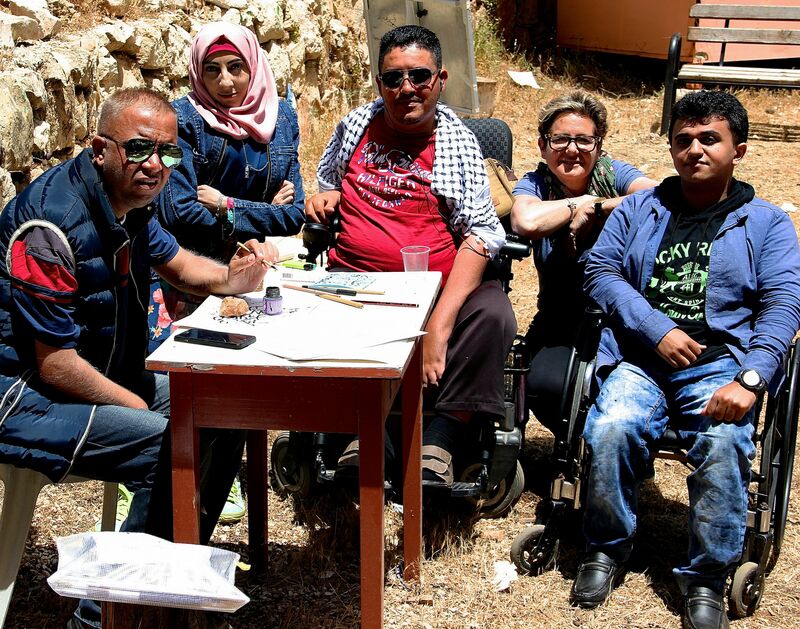 Mira Koussa, Business Development Assistant at the British Council, adds that opportunities like this collaborative provide disabled Palestinians – artists and non-artists – with an important source of confidence in asserting their identity and contributions they can make to society. In the UK, Gadsden added that the response to, and exposure of, their creative output at the various exhibitions has been phenomenal. She says that one of the biggest issues she has faced, however, has been in managing the expectations of her Palestinian collaborators. Collaborative projects with artists in the oPt will, by the nature of the context, be riddled with logistical and societal issues and challenges. But this should infuse rather than deter would-be collaborators. Movement restrictions – both locally and internationally – can have a profound impact on plans, ambitions and outcomes. Local movement restrictions imposed by Israel make travel within the West Bank (not to mention between Gaza, the West Bank and East Jerusalem, which is virtually impossible) extremely challenging and time-consuming. And as Ashour, Hussein and Gadsden experienced, getting visas for Palestinian artists to collaborate in the UK was often proved frustrating and disappointing. Despite these considerable challenges, the need for such international collaborative artistic projects is huge, and the potential benefits to artists in the UK and in the oPt – and to audiences in the respective locations – is enormous. Gadsden and her Palestinian collaborators have succeeded through It was Paradise in showing that “cultivating hope” through such a project is profoundly worthwhile.